05/01/15 – Update v4.6 Spectator ALT Zoom & Team Voice Chat Added! Everyone has wanted the ability for spectators to ALT Zoom, so they can easily see what’s going on when they are just watching others play! Another feature that was wanted for quite some time is being able to drop 1 item at a time while holding a bunch of items. Both of these features have now been added for overall better game play! All hosts now connect to the proxy server by default (players will only connect through the proxy if they fail to connect normally). Auto option for the proxy server chooses the closest proxy server to you for the lowest ping. This should eliminate all connection issues, if you run into any let us know. Rules menu now supports BBCode for all your formatting needs. You cannot accidentally edit the rules now, because you must first hit the edit button. Only admins can edit the rules of a game now. 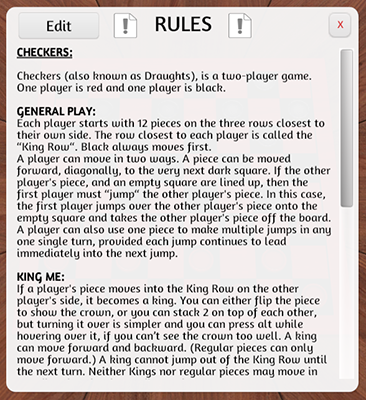 Updated the default games rules formatted with BBCode for better readability. Alt zoom now works in spectator (finally!). 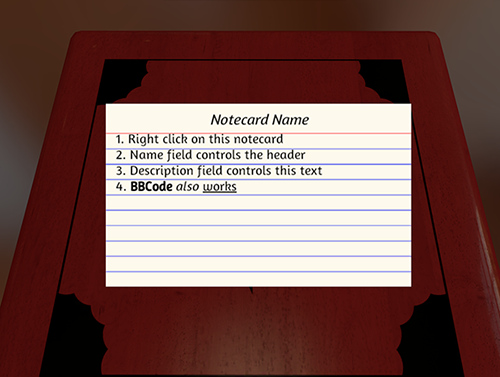 Notecards can now be alt zoomed for easier readability. ‘Alt’ + ‘Right Click/Tap’ now drops the last object you picked up instead of all objects except the first. This is great for games in which you need to drop singular objects, or if you want an easy way to distribute held objects one at a time. Team voice chat has been added if you want to secretly communicate by using the ‘V’ key. Optimized box selection when there are a lot of objects on screen. General optimizations to reduce fps stuttering. The keybind help menu has been updated with the latest additions (Grouping, Team Text Chat, Team Voice). Fixed error loading certain save files that had joints with deleted components. Reduced the amount the notecard text clips through the backs of a flipped notecard. Stay up to date on development by following us on Twitter and Facebook! Every so often we giveaway keys, so be sure to like/follow us for a chance to win!